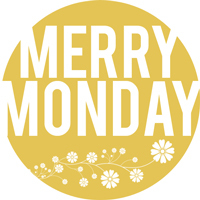 I’d like to introduce ‘Merry Monday’ here on the Simply Fresh Designs blog. You’d be expecting Freebie Friday… but we need something to make Mondays a bit more fun… So – Merry Monday it is… with a freebie. Perhaps you’ve heard the quote… Keep Calm and Carry On. In the Spring of 1939, with war against Germany all but inevitable, the British Government’s Ministry of Information commissioned a series of propaganda posters to be distributed throughout the country at the onset of hostilities. … The posters were intended to offer the public reassurance in the dark days which lay ahead. The intent of the poster was to convey a message from the King to his people, to assure them that ‘all necessary measures to defend the nation were being taken’, and to stress an ‘attitude of mind’ rather than a specific aim. At the end of August 1939 three designs went into production… The first poster, of which over a million were printed, carried a slogan suggested by a civil servant named Waterfield. Using the crowns of George VI as the only graphic device, the stark red and white poster read ‘Your Courage, Your Cheerfulness, Your Resolution will Bring Us Victory’. 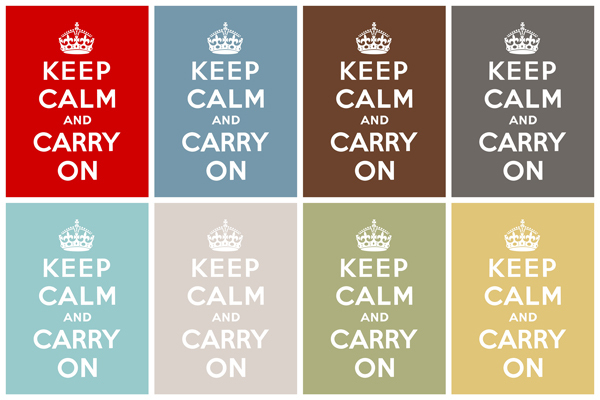 … The third design, of which over 2.5 million posters were printed, simply read ‘Keep Calm and Carry On’. The ‘Keep Calm Carry On’ image is in the public domain according to Wikipedia. So I figured I’d swap out the colors, resize to 8×10 for easy printing, and post a few options here. Print the images just as you would a photo using a photo lab such as Costco, Sams Club, Walmart, Target, or print on your home printer. The images are 8×10 in size. Matte and frame and you’ll have a positive reminder in your home to keep a goin’ calmly! Look out soon for more prints similar to these in the Simply Fresh Designs Shop under ‘Other Prints’. Thanks Heather. You are THE BEST! This saying has gone viral all over the craft world. There are many variations of it and I could not figure out where it came from. THANK you so much for sharing this. It makes all the new variations so much more fun! Thanks for sharing your talents with us to use and enjoy. Really like the free downloads for the Quiet books too. Wow, thanks for your time! Love these! Thanks Heather! Posed a link on my renovation/design blog and candy buffet FB page! You rock! I had never heard of the history behind that quote-thanks! I’m giving some of these as baby gifts. Great for a first-time Mom!! Thank you soooooo much! THANK YOU!! i love love love your gospel printables thanks for all your work!! Thank you Thank you!! I’ve been searching forever through Google, finally!! You’re the best! Just wanted to say thank you for such a great printable. I love that you gave multiple colors to print. I featured this on TheRedPolkaDot. Have a great day! Thank you!!! I have been searching for this! I can’t wait to get to work with the projects I have in mind! i just found these printables. THANK YOU!! What a blessing this is… they are what I have been looking for forever!! Thanks so much for the background info that was very helpful. oh, you don’t know how much time i’ve spent to find free keep calm posters! thank you so much! YOU MADE MY DAY! my daughter wants all 8 books for the holidays. any idea where i might find them? Thanks you so very much! You don’t now how much you have helped us. I couldnt print this. Is it no longer available? Or am I doing something wrong? I have been looking for something with this quote that I could use on a project. Thank you for your generosity. Thanks so much for all of these downloads. Just what I was hoping to find tonight.